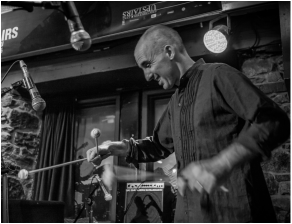 Michael Emenau/P.K.A MNO- (McGill 1989, Bac music, classical percussion) has worked professionally as a vibraphonist, producer, re-mixer, and arranger for 25 years, playing such diverse genres as, jazz, rock, drum&bass, salsa, techno, country, Hindustani, gospel, baroque and orchestral music. During this time he has produced 16 albums recorded on another 150, composed music for 8 films, toured internationally, and lived on 3 continents. He has performed at such diverse venues as Carnegie Hall, Roy Thompson Hall, The Fillmore West, Suntory Hall (Tokyo), The Knitting Factory, Boom Festival (Portugal) and the San Francisco/San Jose/Montreal/Toronto/Ottawa/Rimouski/Halifax Jazz Festivals. As a solo recording artist he has released a series of highly acclaimed solo CD’s on the boutique record labels, Hearts of Space, Daikini, and Six Degree’s records. Currently he is member of Ben Charest’s “Orchestre Terrible de Bellville, and “Tur Malka” featuring Canadian jazz vocal legend Karen Young.